The GTP-80x series is a Single-Port, Mid-Span IEEE 802.3at High Power over Ethernet converter designed specifically to satisfy the growing demand for higher power required network equipment such as PTZ (Pan, Tilt & Zoom) network cameras, PTZ speed dome, color touch-screen VoIP telephones, multi-channel (IEEE 802.11a / b / g / n) wireless LAN access points and other network devices that need higher power to function normally. 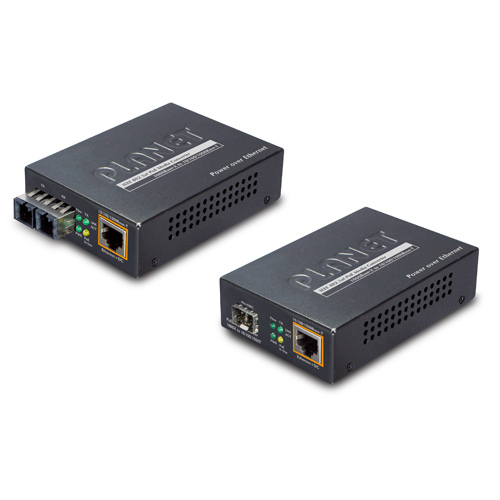 The GTP-80x High Power over Ethernet converter series is an ideal solution to delivering data and power to network devices directly via the RJ45 Port interface without the need for installing extra power outlets and electrical cabling. The GTP-80x series provides 52V DC power over Ethernet cables — just insert DC voltage into Cat.5/5e/6 cable, allowing the cable between the PoE splitters (POE-151S / POE-152S / POE-162S) to transfer data and power simultaneously for up to 100 meters. Then it will spilt the digital data and the power into two kinds of selectable DC outputs (5V DC / 12V DC) or (12V DC / 24V DC).Thus, it reduces cables and the dedicated electrical outlets on the wall, ceiling or any unreachable place. Most of all, it also eliminates the time for installation. The high Power over Ethernet solution frees the security IP camera and wireless AP deployment from restrictions of power outlet locations. For the places difficult to find the power outlet, the GTP-80x series provides the easiest way to power your Ethernet devices such as PLANET IEEE 802.3at / IEEE 802.3af PoE splitter (POE-151S / 152S / 162S) and non PoE compliant Internet camera or wireless PoE access point. For instance, users can flexibly install the security IP camera, wireless access point and other IEEE 802.3at / IEEE 802.3af compliant network equipment around the corner in the public areas such as station or freeway for surveillance demands, or build a wireless roaming environment on the campus or at the airport.